A unique gift code(s) will be sent to your mailing address after you’ve completed your purchase. You can then forward these codes to your loved ones for test redemption. 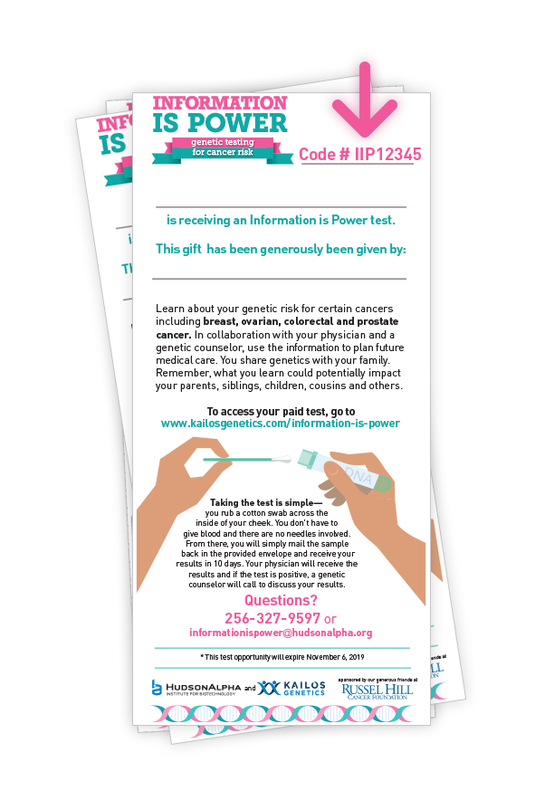 The offer for the test expires Nov 6, 2019.
Who is eligible to receive a gift test? Any consenting adult (19 and older) and who live in any U.S. state other than New York and Maryland. Disclaimer: This gift is for people interested in the information, but it should not be used as a substitute for genetic counseling or testing for a strong family history or known familial mutation testing. The HudsonAlpha Foundation, a 501(c)(3) nonprofit organization, is the supporting entity for the HudsonAlpha Institute for Biotechnology. Tax-deductible contributions to the foundation are for the sole purpose of advancing the mission of the HudsonAlpha Institute for Biotechnology.